Hot-air engine driven praxinoscope produced by Ernst Plank in 1898. The first time I was face-to-face with Francis Ford Coppola, I played it pretty cool. My friends and I had scored free tickets to a silent auction and dinner in Napa Valley’s favorite upscale town of St. Helena, but it wasn’t a fancy event. People milled around in the airy barn-like hall sipping wine. I mostly sat with my friends at a table, getting up now and then to check on the auction items I had bid on. It never occurred to me that Mr. Coppola might be in our midst. When it was time for dinner, a woman got on stage to thank us all for being there and tell us more about the event. My mind started to wander. Then I heard “…and Francis and Eleanor Coppola, for their very generous support...” She was smiling and looking at them seated a few seats away from me. Francis Ford Coppola is here? …there? I was fascinated by my proximity, but kept my cool, and then forgot about them altogether since it was time to eat. After dinner, people got up and shifted around, the auction had closed and it was time to see what we had won. I went up to the auction board to see that I had won exactly nothing. It was disappointing. As I made my way through the disorderly chairs back to my seat, I noticed that the person just ahead — the one that was blocking my way — was Francis himself. He could have been my dad, the way he was sitting there in a black suit, shirt unbuttoned at the top, leaning back on the metal folding chair pushed back from the table. Eleanor wasn’t with him. She must have been collecting the auction items she won. He gave me a quizzical, almost shy look, offered a sort of smile and let me pass. Now that I had a personal history with Mr. Coppola, I felt like it was time to visit Inglenook, his Napa Valley winery. 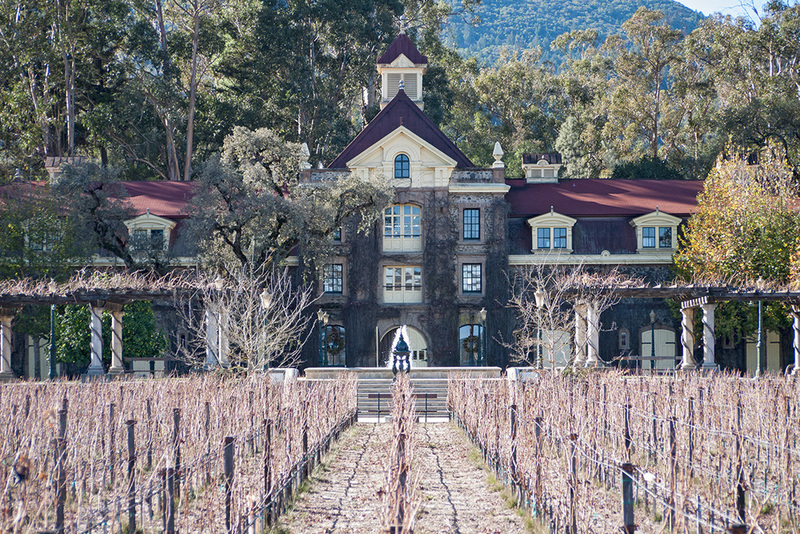 Established in 1880 by Finnish sea captain Gustave Niebaum, this grand historic estate was the first Bordeaux style winery in the USA. The Coppolas purchased it in 1975 with profits from The Godfather films and it has been their Napa Valley home ever since. 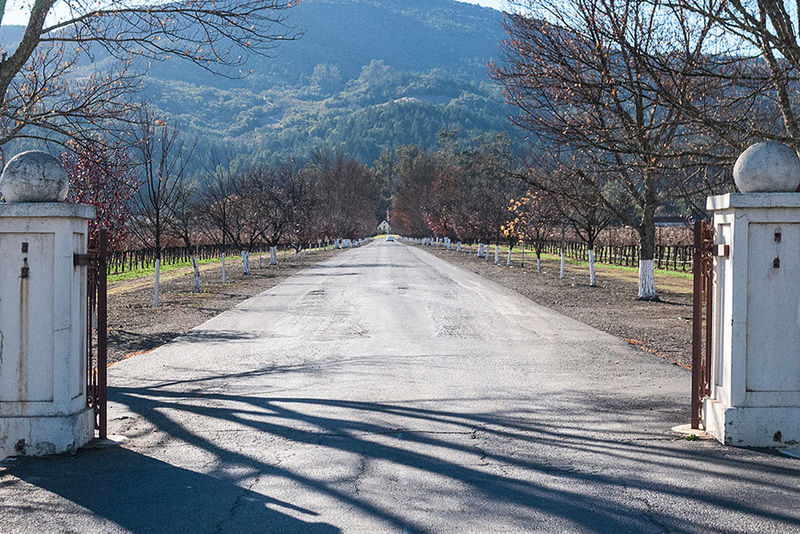 Tucked away from the busy road, Inglenook’s pergola and fountain invite you to hang out and enjoy the surrounding vineyards and historic facade. 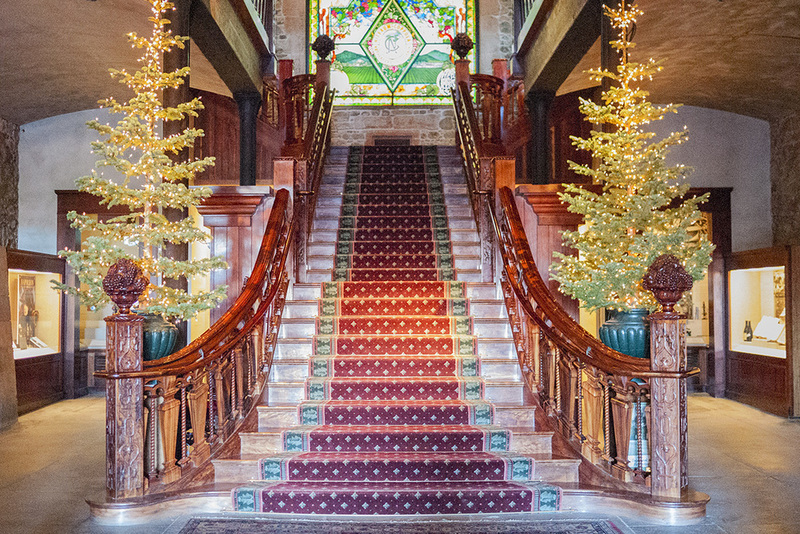 Step inside the grand 19th century chateau and an elaborately carved wooden staircase beckons you to explore a world of delightful early motion picture inventions. 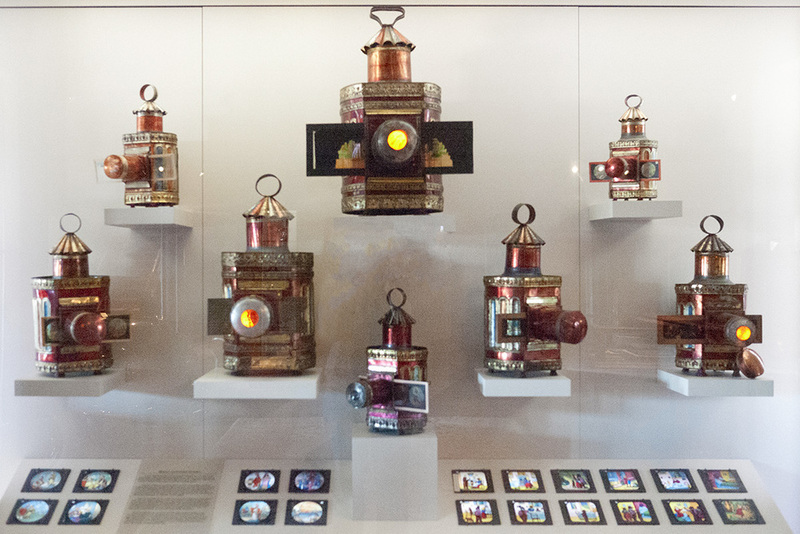 Here is Francis Ford Coppola's vast collection of zoetropes, phenakistoscopes, magic lanterns and other animation machines. This is a tribute to the artists, dreamers, inventors and storytellers that have come before and I almost didn’t even care that there was wine here too. But there is. And it's good. Visit the European-styled bistro, where you can purchase wines by the glass and explore the place at your leisure, wine in-hand. 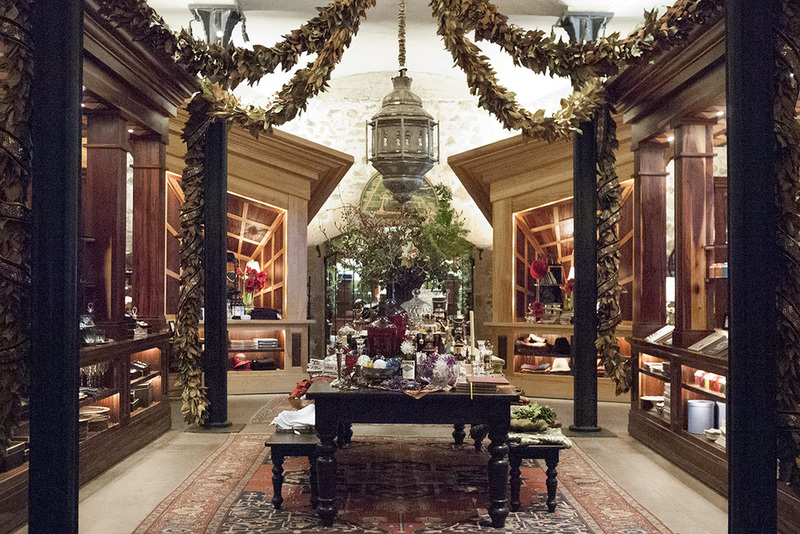 Stay all day if you want, and don’t miss the stylish boutique that offers rare and unusual items from around the world. There’s a lot to see at Inglenook and you get the sense that the Coppolas are directly involved with making your experience a memorable one. Completely enamored by my experience at the winery, it was time to get personal with my neighbors, so I read Eleanor’s books, Notes on the Making of Apocalypse Now and Notes on a Life. Like Francis, she is an artist who struggles to realize her vision, but her creative drive is often eclipsed by family responsibilities and Francis’ fame. Candid and daringly honest, she freely invites us into her family’s lives and her personal thoughts. I liked her. Interestingly, she was the same age as I am now when she was writing her first book. Even more curious, her daughter Sophia was born the same year I was, just a few weeks earlier. So while Sophia was toddling around the Philippines when her parents were making Apocalypse Now, I was doing exactly the same thing around Cleveland when my parents were making ceramics. I wondered what else we held in common. And so the Christmas season arrived in Napa Valley, and I learned that Inglenook was hosting a holiday open house complete with complimentary wine, hors d’oeuvres, and live music. I didn't want to miss it. The announcement said The St. Helena Community Band would be playing. A look at their website revealed that Francis was the founder of the band, but not much else. I didn’t know what to expect. When I arrived at the winery that night, servers were delivering appetizers on silver platters to guests, wine was being poured in the boutique and orchestral music was floating through the old stone rooms. Upstairs in the Barrel Room I found the concert — a full orchestral band playing selections of jazz, Christmas favorites and Carmine Coppola’s (Francis’ dad) original compositions. I entered and was enchanted. The large room was crowded and I had been standing along the perimeter with other late-comers. When I saw several seats open up in the middle section, I moved in. As I sat down, I noticed Eleanor and Francis Coppola were seated just a few seats away from me. What luck! I was perfectly positioned to catch them after the show. It would be easy to say hello and thank them for this lovely community event. A quick look at the program informed me there were a few more pieces to be performed. Yay. The music was delightful. I was happy, entirely in the Christmas Spirit and looking forward to having my first real exchange with the Coppolas. And then my phone vibrated. Rob was waiting for me outside. We had agreed to eat dinner at 7:00 and it was already 7:15. I remembered he hadn’t eaten since morning and I didn’t want to leave him waiting, so I had no choice but to accept defeat. I left my most-perfectly-positioned seat and quietly exited the concert hall. One of these days, maybe I’ll bump into Eleanor or Francis at the local Safeway and have a proper chance to say hello. Until then, you’ll likely find me in the Inglenook bistro, enjoying a glass of their latest Cask release while tapping away at my laptop. Thank you, Francis and Eleanor Coppola for the delightful Christmas concert, and Merry Christmas to everyone!